Join The Basement in the Liverpool Santa Dash 2014 on Sunday 7th December. On busy evenings the Basement staff can see up to 40 homeless people a night who visit our Centre on Parr Street to access advice on accommodation, benefits and health matters. While gaining support for these issues, individuals can utilise the wash room facilities and clean clothing provision facilitated in our rough sleepers drop-in service which runs from 5.30pm to 9pm every week night. Basement Sponsorship Gift Aid forms. Let us know you are taking part by telling us on Facebook or Twitter. When you have all your sponsorship collected there are a number of ways to get it to us, just pick the way that’s easiest for you! Or use our online donation portal from BT MY Donate – and allow your friends to sponsor you online – The funds will come straight to us and the people who need it most. Good luck! 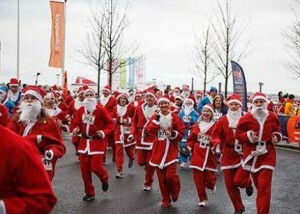 We look forward to seeing you dressed up in your festive running outfits! !